1. Halve any thicker leeks. Melt the butter in a non-stick frying pan, add the leeks and a pinch of salt and fry over a medium heat until golden all over (about 5 minutes). Pour in the stock and simmer for 7-10 minutes until the leeks are tender and the stock has pretty much evaporated. Add the pickling liquid and take off the heat. 2. While the leeks are cooking, combine the crème fraîche, gherkins, dill, chilli and lemon zest in a bowl. Toast the sourdough. 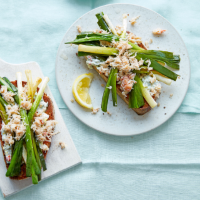 To serve, put the toast on 2 plates and top each slice with half the crème fraîche mixture, then the leeks and the crab, with the lemon wedges alongside.